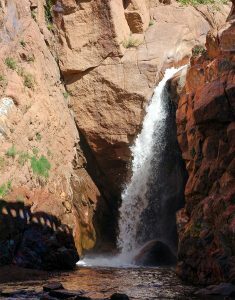 El Paso County Parks has announced that Rainbow Falls Recreation Area will reopen on Saturday, Sept. 8 after being closed for much of the summer for major renovations to the trails and parking area; and for significant upgrades adjacent to the falls. “The improvements completed this summer is another major step in renovating the Rainbow Falls Historic Site”, said Tim Wolken, Director of the Community Services Department. “We appreciate the support of the Colorado Department of Transportation, Manitou Environmental Citizen Action, and the many other volunteers for their support for this improvement project”. The site will only be open on weekends, from 10 a.m. to 4 p.m., through October 28. Renovations of Rainbow Falls Historic Site have been underway since El Paso County secured ownership of the property in 2010. It was designated an historic site in 2016. For more information please contact El Paso County Parks at 719-520-PLAY.